Belfast Giants got their Challenge Cup defence off to a successful start with a 4-2 victory away to Dundee Stars. Two goals from new signing Kyle Baun helped secure the Group B win after the Giants' 2-0 lead had been cancelled out. Jim Vandermeer and David Rutherford scored in the first period for the visitors before Fabrizio Ricci and Matt Marquardt drew Dundee level. The Giants defeated Cardiff Devils 6-3 in last season's final. That result ended a three-year trophy drought in what was head coach Adam Keefe's first season at the helm in Belfast. Saturday night's match was the first of back-to-back Challenge Cup away matches for the Giants, who travel to Fife Flyers on Sunday. 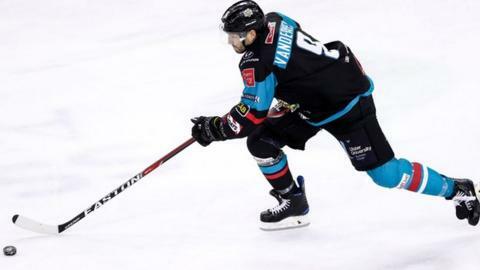 The Giants wasted no time in opening the scoring in Dundee as experienced defenceman Vandermeer fired home from the blueline after just 41 seconds. Rutherford doubled the Giants' lead in the 15th minute, with Ricci getting one back for Dundee from a Jordan Cowie assist. Marquardt's snapshot at the start of the second period drew the home side level, before Baun restored the Giants' lead by deflecting home Kendall McFaull's shot in the 36th minute. Debutant Baun got his second 10 minutes from time to secure the victory for the Giants. Keefe had said before Saturday night's game in Dundee that he was trying to ease his Giants players into the new season in a bid to avoid picking up injuries.